tekom qualification modules have been defining the requirements placed on knowledge and practical abilities in the field of technical communication since 2003 and describe the various areas of competence in that profession. The qualification modules therefore provided the occupational profile for a technical communicator. tekom has fundamentally revised these qualification modules in a project with the help of a Technical Committee from the Advisory Body for Training and Development and has created a cross-industry Competence Framework for Technical Communication. This new Competence Framework describes the occupational profile and potential job profiles in technical communication. It defines practice-based and action-oriented skills of the kind that are used in technical communication workplaces and the requisite qualifications. In doing so it focuses on the creation of information products. Required skills for supporting tasks such as terminology work or management processes will be described at a subsequent stage. The tekom Competence Framework for Technical Communication systematizes, defines and classifies qualifying competencies, knowledge and proficiencies for persons employed in technical communication through a classification schema (taxonomy). 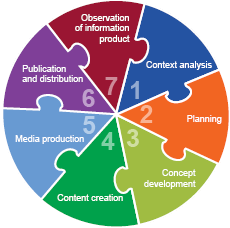 This taxonomy was developed on the basis of the reference process for developing information products. The taxonomy describes, for the seven process steps, the respective areas and fields of competence, as well as the underlying thematic blocks with teaching contents and learning objectives. tekom’s Competence Framework provides clear, basic guidance for companies of any kind and for technical communication employees and people who are interested in or entering the profession who need to make decisions relating to job advertisements, personnel selection, careers, further education, training, curricula, exams, assessments etc. It sets out the requirements placed on technical communication skills and qualifications in a clearly understandable manner. The Competence Framework is multilingual: it is initially available in German, English and Chinese and can be accessed over the Internet. Users can access it interactively and can therefore use it in the way that is best suited to meet their particular individual requirements. It has been implemented as an interactive profiling tool which can be used to create skills profiles in a targeted manner. The Competence Framework’s interactive profiling tool allows users to select necessary elements that are relevant to their specific requirements at the sphere of knowledge, field of competence, thematic block and teaching content levels in a targeted manner. The user can then output these elements in a personalized skills profile. tekom’s Competence Framework for Technical Communication will, after a transitional period, supersede the previous qualification modules for technical communication by early 2017.